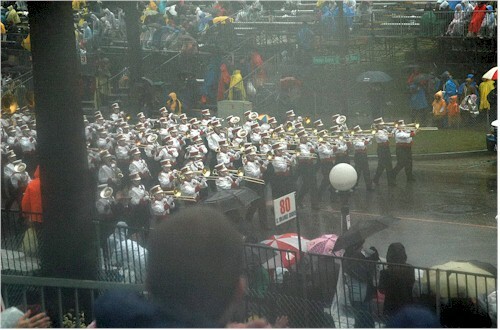 This is my best shot of the band going by our grandstands in the Rose Bowl in the miserable, driving rainstorm that lasted all morning. Scott is the third trombonist left of the lamp post in the front row. The person just to his right is much taller than he. My camera fogged up and this photo is better than I thought it would be. I probably should have taken a few more, but I couldn't do anything like changing lenses, because it was just raining too hard.